Maharaj Siri Guru Arjan Devjee is talking to us today in the sorath raag. The Sorath raag is a raag in which praises of Waheguru are sung. Sorath raag is a raag in which merits of God, qualities of God are talked about. The raag has a very beautiful quality of getting us in touch with Waheguru jee's gun - Waheguru jee's praises. Guru Arjan Devjee has written this in the ghar 1 - in the first house, the ghar pehla means this shabad is in the dadra taal which has six matra, it is also in asattapadheeaa - asatt means eight, padheeaa means feet - there are eight feet to the shabad. There is one creative, nourishing, destructive being, sat - who is true forever, gur prasaadh - who is found through the Guru's Grace. Sabh jag - this whole world, jinehi oupaaeiaa - meaning to create, bhaaee means brother; O brother the one who created the whole world, karan kaaran samarath - He is the cause of all causes. He has caused everything. Samarath means the One who knows everything, who is omniscient. Jeeo means soul, pindd means body, jin - who, saajiaa - means to created; He is the one who has created, Waheguru jee is the One who has created the soul, the body and the mind, dhae kar means by giving, apanee means His own, vath means power. By investing a part of Himself into the mortal, Waheguru made this body, this soul. This soul is a part of Waheguru jee's immortal power. Kin - means how, keheeai - means to describe, how can we describe Waheguru, O brother. Kio dhaekheeai - how can He be seen with these worldly eyes? Karathaa eaek akath - because the Creator is One and He is indescribable, you cannot describe God, we do not have the words to describe Waheguru. 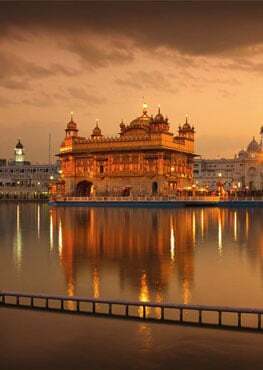 Gur means the Guru, Govindh means the seed of the universe which is talking about God, salaaheeai means to sing the praises of; sing the praises of Guru and of Waheguru, O bhai. If you want to realize God, jis thae jaapai thath - jaapai means to find out, thath means essence, the essence of life, the essence of God, the essence of that all mighty, that all creative being can only be found from the Guru. So praise the Guru, read the gurmantar, only be praising the Guru will you find this. O my mind, japeeai - means to meditate, meditate upon Lord God. What does He do when you start doing His meditation? He gives you the gift of naam dhaan - He gives you naam - His name when you start doing His meditation. He blesses His servant with the gift of His name, then what happens? He ends the pain and suffering of His servant because the one who is attached to the naam is above pain and suffering. Rehaao - Gurujee says pause and think about this, you want to be above pain and suffering, then meditate upon God. O brother, in His house, everything comes from His house, everything is His. No nidh bharae bhanddaar - His treasure chest, His warehouse of goods which is this world is overflowing with the nine treasures, with all treasures. The nine treasures is a concept in India which is meant to encompass all the other treasures of the world. Basically Guru jee is saying that God has created everything, everything belongs to Him and He is the one who gives us everything. You cannot put a value on God, He is above value, O brother. He is higher than high, He cannot be known by this mere mortal understanding, He is apaar - He has no end. O brother, Waheguru jee looks after all creatures and beings, every single thing. Cheettee thae kunchar asathoolaa - from the smallest ant to the biggest elephant Waheguru jee is looking after them all, Guru Gobind Singh Jee says in Chaupai Sahib. Nith nith karadhaa saar - day in and out Waheguru is one the One looking after all these beings. O brother, meet with the true Guru, from inside, from your heart. What does the true Guru do? He milaavanehaar - He is the One who can unite you with shabad, with the word of God, with the mantar of God and then you become One with God. Serve the Guru, the true Guru, Guru Granth Sahib jee, serve the true Guru with all your love, O brother! Bharam bho hovai naas - your doubt and fear will be destroyed if you serve the Guru and if you follow everything that the Guru says. Join with the saints then what do you have to do? Man maajeeai - cleanse your mind, clean your mind, O brother. Har kai naam nivaas - then live in the name of God, make everything you do in the name of God, make everything you do in meditation, make everything you do in God's work, then what will happen? The darkness inside you, O brother, of ignorance will be destroyed. Inside you the Lotus of your heart, of your love will blossom forth. Through the Guru's Words, through the Guru's command peace will well up inside you, will grow inside you. All fruits, all things that you can desire are with the true Guru. The true Guru can give you anything that you desire. Give up that sense that this is mine, this is yours, I own this, I own that, give up that sense inside you, see God in all, give it up my brother. Become the dust of the feet of all, becoming the dust, we get confused here sometimes, we think that becoming the dust of everyone means to be pushed around by others, it doesn't. Becoming the dust of the feet of all you need to see God in all, it means treating everyone the same with that love and respect. Waheguru is in each heart, everywhere, O brother. He sees and He listens, He is ever with us. He is with us all the time, He listens and sees everything we do. On that day where one forgets Waheguru, supreme Waheguru, O brother, on that day you should cry out with pain that you've forgotten God. On that day when we lose our amritvela, on that day when we don't make time for rehraas; that's the day where we feel pain. You'll feel the pain yourself if you start doing nitnem and you miss a day. Waheguru is the cause of all causes, all powerful, all knowing, all omniscient, sarab kala O brother! From all angles, complete virtues - God is bharpoor. O brother, praem padhaarath - the most beloved treasure is the God's name, because what happens through the naam, what does the naam do? The attachment to this illusion, to this false world is broken through the God's name. If it is pleasing to Waheguru then He unites you with Himslef. Hiradhai - in your heart, naam nivaas - the name of God takes permanent residence in your heart if Waheguru wants that to happen. The guramukh who follows the Guru, what happens in him/her? Kamal pragaaseeai - the heart lotus blossoms inside, the lotus of love blossoms and inside their heart there is an illumination, a paragaas - there is a lightness to them of the Truth. The glory of God is revealed to us, O brother! Because the earth and the sky have blossomed forth in His Love. The True Guru has blessed me with contentment, with happiness, with peace, O brother. I am attached into God's Love day and night. My tongue continually chants God's name, day and night, all the time, O brother. I've tasted the Truth and I understand what is the meaning of this human life. With my ears, by listening to Waheguru in everything, I am alive. The nihachal - the unmoving state, I've found the unmoving state, I am not going to come back to this earth again, I've become One with the One Who is ajooni - Who is beyond birth and death. That soul who doesn't have love for God, O my brother, that soul will burn. What will it burn in? It will burn in lust, ego, desire, greed. My Lord and Master has many virtues, my Waheguru has so many virtues O my brother, I am a sacrifice to God Who has so many virtues. Even people who never think of Waheguru, who never thank Waheguru, who never attach themselves to God's feet, even then He looks after them, even then He gives them food to eat. He is so merciful, O brother. To the homeless one he gives a place. He gives us our daily food, with each and every breath He looks after us. His name is everlasting, His name is colored in Love. That person who meets with the True Guru, O brother, that person has perfect destiny. I cannot live even an instant without Waheguru, O brother. He is fulfilled with all powers. With each breath, with every morsel of food I eat, every second I don't forget Waheguru, O my brother. I see Him all around me, always present with me. In the company of the Holy, in the company of the saints I met God and now I've realized that God is permeating through everyone, through everything. Those people who are taken into the love of God, who do not embrace love for God, O brother, those people die in pain, writhing out, crying out in pain. No one embraces True Love for God in their heart therefore, they all suffer, everyone is suffering. I hold on to the hem, the bottom of the God's robe, the bottom of God's kurta - this is a metaphor for saying I am holding onto God, I am grasping onto God's Lotus Feet, what happens if you hold steadfast to God? - You are carried across this world ocean. This ocean of fear and pain - we are carried across it by holding onto Lord. If you want to be carried across this world ocean then attach yourself to God, you have to take away the attachments of this world. God has been merciful upon me, He has blessed me, He has blessed us with what? - with His beautiful vision, O brother. He has made Himself, He is Himself made a promise to be with us until the end. Then what has happened? My mind and body has become soothed, O brother. The only food that I need now is the Name of God, that is my only support. Naanak has come under Waheguru jee's sanctuary, O brother, because only Waheguru is the one Who can cut through these sins, only Waheguru is the One who can destroy through our sins, only Waheguru is the One Who can liberate us, break us from these bonds of maya. So what Guru jee is saying, jap naam - meditate upon God, meditate upon the mantar - Waheguru, meditate upon the mool mantar and then what will happen? Your pain and suffering will be destroyed, you will become a king upon this earth and you'll be respected in the world hereafter.